A couple of weeks ago I saw a tweet recommending the February free download from Tor.com, The Bloodline Feud. 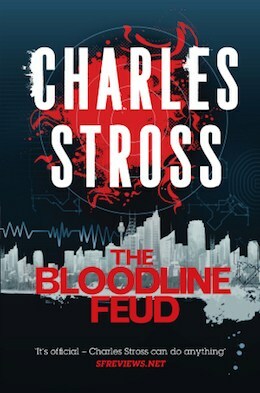 The book combines the first two novels in Stross' The Merchant Princes series. Our protagonist is a hip tech journalist that accidentally transports herself to a parallel world set in feudal times. It turns out she is a long lost princess in this feudal timeline of America, and predictably not everybody is happy to know she exists. But then the story takes a sharp turn to the more interesting when she learns this world walking between parallel worlds is a family trait, and that the family uses it to transport massive amounts of heroin across the US by taking it the feudal world, getting it the west coast, then bringing it back to our timeline. Then we learn there is a 3rd timeline in which the US did not revolt and early 1900s Boston is a steampunk inspired British colony. It won't surprise me if we learn of more worlds in books 3-6. However instead of following the straight fantasy path with the story, Stross makes it really interesting by turning it into an economics novel. 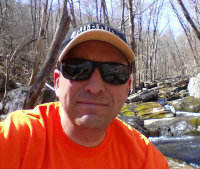 If you could freely bounce back and forth between these three worlds, and wanted to make a fortune in a legitimate business, what would you do? What do we have today that you could bring back to steampunk Boston to get rich, and not get yourself branded a witch at the same time? You'll have to read the books to get the answer, but I assure you that you will enjoy the journey. And the free book gambit worked too, as I've got books 3-6 queued up in Amazon wish list.